Directors come and go, while other things prevail, one of the most enduring features at Palmeiras being the lack of transparency and information. And where there is none, people will guess. Or make things up. Not good. Was Palmeiras really that pressed to sell? Is it true that Barcos considered doing just like Fernando Prass did at Vasco – be liberated from his contract due to the club owing him three months worth of salaries – and simply transfer for free? Was his dissatisfaction with the outlook of playing in the second division starting to contaminate the rest of the squad? The answer to all of the above is, quite likely, yes. Even if disregarding the above, there are valid arguments for selling Barcos. 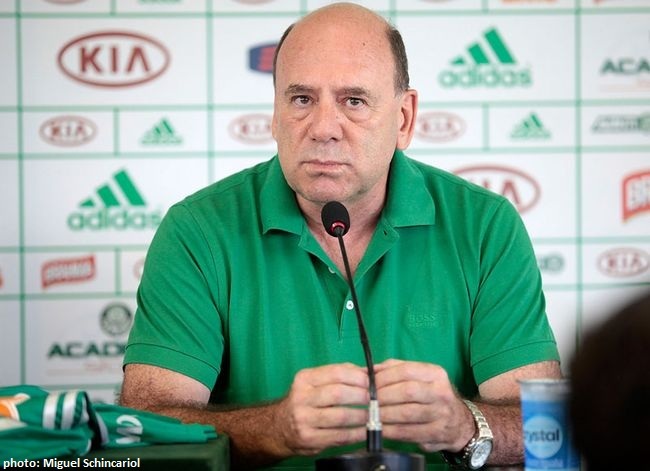 Palmeiras are short on cash, short on players and cannot depend on one man alone. Barcos had a brilliant year in 2012 but that wasn’t nearly enough to save Palmeiras from relegation. And what if he got injured? The risk (yes, the risk) of keeping him on the expense of generally strengthening the squad must not be overlooked. That being said, did Palmeiras get a fair price? No, we didn’t, as normally happens when you’re negotiating with the rope around your neck. Our top scorer and kiddie idol – a serious, hard working, peaking professional – apparently went for US$ 5 million. Take 30 per cent off and you get what Palmeiras paid for Luan back in 2011. Just food for thought. Brunoro – the honeymoon didn’t last long. Why “apparently” US$ 5 million? Because the info has not been confirmed by Palmeiras’ directors, who instead chose to sell in the deal with us supporters as a five-for-one swap: Palmeiras were letting Barcos go in exchange for no less than five players from Grêmio: centre-back Vilson, defensive midfielder Léo Gago, offensive midfielder Rondinelly, strikers Marcelo Moreno and Leandro, in addition to some US$ 3.5 million cash. Grêmio and Palmeiras thought this was a great deal. Too bad no-one had asked the actual players involved. Imagine the resentment from 25-year-old quality player Marcelo Moreno – and that of his father/agent – when learning he would be part of a package of five. The reaction – and especially the disrespectful tirade from the father – is by many a palmeirense considered a deal breaker in itself. From Grêmio, Vilson, Léo Gago and Leandro have arrived (and signed contracts until December). Rondinelly might be on his way also. In regard to Moreno, Brunoro might have settled for a compensational cash sum, although rumours of a triangulation with Cruzeiro surged earlier this week, where Moreno would join the club from Belo Horizonte and Cruzeiro, in turn, pass on two player to Palmeiras (allegedly Borges and Victorino). Hey, Brunoro might even surprise us all and in the end bring Moreno over. It’s wait and see. It’s also wait and see in regard to what Palmeiras de facto can do with these players when their contracts expire. Barcos has left for good, while some of the Grêmio players involved in the swap seem only be coming on loan. Explanations, please! The picture might clear up tomorrow as the political group Fanfulla – on a fact-seeking mission – has managed to schedule a meeting with the directors. In the midst of all turmoil, Palmeiras tonight debut in the Libertadores Cup. We are likely to see some new faces against visiting Sporting Cristal from Peru, but not the newly arrived Grêmio players: all of them, except for Vilson, have previously been entered in the competition for Grêmio and thus cannot play for Palmeiras in the group stage. Still, expect Vilson, Marcelo Oliveira and from Corinthians recently signed right-backer Welder pulling on the green jersey for the first time. Expect a difficult game. We need the result. If Palmeiras lose (or only draws) and then loses Sunday’s derby to Corinthians, Kleina better start looking for another position to fill.